The farm was located in Kujawsko-Pomorskie region of Poland and consisted of 670 sows. Piglets were weaned at 28 days of age. In the farrowing and nursery units the “all in – all out” procedure was maintained. The environmental conditions in farrowing and nursery units may be considered good, while on the fattening units, due to failure to respect the ‘all in – all out’ procedure they can be considered poor. In breeding herd routine prophylactic vaccination against colibacilosis, erysipelas and parvovirosis were carried out in the farm. The vaccination against PCV2 was administered on piglets. Vaccinations consisting of the vaccine with an inactivated antigen of Erysipelothrix rhusiopathiae were administered in nursery in the 9th and 11th weeks of life. Weaners were transported to be fattened in two buildings – building A1, located in the vicinity of the sector of sows and farrowing units, and A2, located 5 km from the breeding herd. Both fattening buildings had identical living conditions, as well as the same feeding, management and veterinary rules; the only difference was in caretakers and water intake. At the end of November and the beginning of December 2011, frequent deaths and cases of disease with typical rhomboid urticarial (“diamond-skin” lesions) were noted in building A2 (Fig. 1.) over a period of about 2 months, affecting the youngest animals entering the finishing barns. Mortality rate increased up to 4-5% (depending on the fattener group). 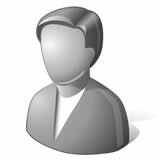 During that time no increase in the incidence of disease or death was observed in building A1. The treatment procedure consisted of introducing amoxicillin (water treatment, 10 days, 20 mg/kg b.w.). This treatment did not solve the problem. Necropsies performed on four fatteners from different batches on the farm at different moments demonstrated splenomegaly in all cases (Fig. 2. 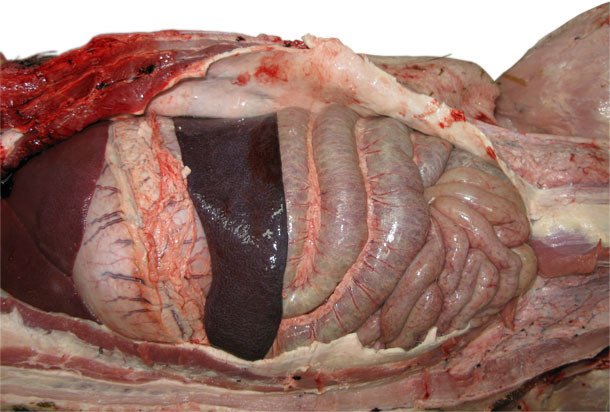 ), injected blood vessels in subcutaneous tissue in two cases and rhomboid skin lesions in one case. The material (lung, spleen, subcutaneous tissue, kidneys) was seeded on horse agar. The identification was performed with the use of biochemical test and by PCR. Furthermore, 20 samples of blood were drawn from two groups of animals (10 each) suffering from swine erysipelas (building A2) and from healthy pigs from building A1 on the 14th day following the second vaccination against swine erysipelas as declared by the caretakers. A similar treatment was performed on 10 animals from building A2, vaccinated under the control of a veterinarian and marked by ear tags. Blood was drawn 3 times in 2 weeks intervals. In the serum samples, antibodies against Erysipelothrix rhusiopathiae were marked using an ELISA test. Bacteriological studies showed growth of only Erysipelothrix rhusiopathiae. On the basis of the results of examinations using the ELISA method for one group of animals marked (ear tags) and vaccinated by a veterinarian which had received the vaccination at 2-week intervals (the average for the whole group) was 0.157 on pre-vaccination period, 0.862 at 2 weeks after the first vaccination and 1.025 at 2 weeks after the second vaccination. Those animals constituted a control group for the animals which were vaccinated by employees of the farm. Comparison of test results of those groups of animals vaccinated by farmworkers compared to the aforementioned group produced a surprising outcome. The average ELISA test results for two groups of animals suffering from swine erysipelas two weeks after the declared second vaccination on the A2 pig farm were 0.149 and 0.155. The average result of the group not affected with swine erysipelas following the second vaccination on the A1 pig farm was only 0.385. The recorded antibody levels are presented in Table and Graph. Graphic. Average ELISA results for the groups sampled. 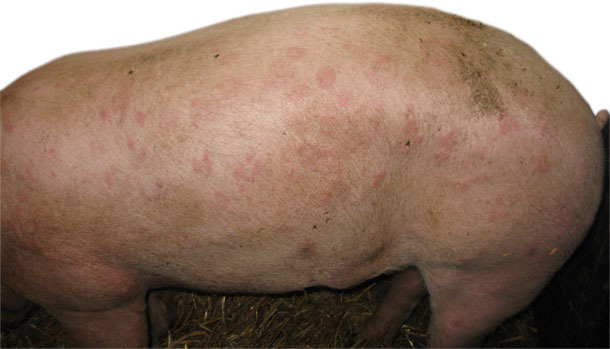 The performance of serological tests clearly demonstrated that levels of the antibody to Erysipelothrix rhusiopathiae in non-vaccinated animals were comparable with respect to antibody levels in animals with active swine erysipelas, despite the declaration that they had been vaccinated twice. In addition, the control groups vaccinated under official veterinary supervision showed a typical response to vaccination in the form of the predicted increase in antibodies. The fact that the veterinarian had been ensured about the administration of vaccinations by farmworkers on several occasions might have dulled his vigilance when he was seeking simple and obvious explanations for the vaccine's ineffectiveness. 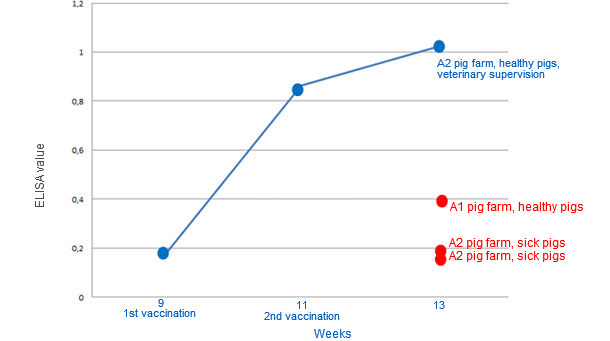 These reassurances forced him to look for the cause of the vaccine's ineffectiveness among infectious agents and unfavourable environmental conditions on the pig farm which could have shortened the duration of postvaccinal immunity. It could also have resulted from that fact that the vaccine implemented on the farm failed to meet expectations. It is advisable to believe that either the vaccine was improperly administered or that only some animals were vaccinated, e.g. those which were at the A1 building, as vaccinations were administered by a worker operating at this production facility. It should not be forgotten that even if the best imaginable vaccine was administered, once it is administered wrongly or if the vaccine implementation is not accurately supervised, meaning that doses of the administered vaccine are not accounted for, such a vaccine can generate the effects observed at the pig farm described above. It was decided that remedial actions would include retaining the type of vaccine implemented at the pig farm. Nevertheless, vaccinations performed at the end of the pig production process will be supervised by a person from the outside. Nuno MarquesMaybe the vaccine have poor immunogenicity, a aluminum hydroxide adjuvent probably. They must try a upgrade to a vaccine with a higher immunogenicity. We should not blame the workers before descart other possibilities of unsuccess. ArturJablonskiWe compared results after "immunization" by workers and immunization by vet. Vaccine was the same.